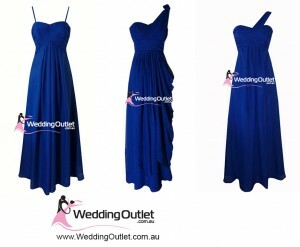 Royal blue dresses are a hot colour this season. 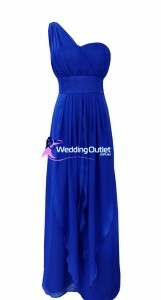 We can make any of our styles on our website in the royal blue or dark blue colour. Take a look at some of our styles. Royal blue is a popular colour for bridesmaids. At the WeddingOutlet.co.nz we offer the Royal Blue colour as well as the Dark Blue colour which is a tad darker than the royal blue. The three styles above is just three we have in Dark Blue, there is more colours on our website. 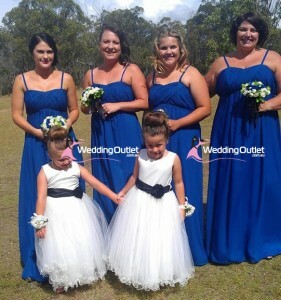 All bridesmaid can be mixed and matched with the colour you want them made in. For example the colour below is called ‘Royal Blue’ the one above us, that is ‘Dark Blue’. You can also browse our colour charts to see the difference.